The task can be a lot tougher than it needs to be if it involves dealing with hot environments. The Classic Cool Vest – Safety Blue will keep you cool and comfortable while the bright blue coloring makes certain others see you. This vest includes one GlacierPack Comfort set that can be replaced without removing the vest. Manufactured with a hermetically sealed outer barrier film, this pack is easily cleaned and sterilized. Glacier Tek Cool Vests feature proprietary GlacierPacks Manufactured with renewable phase change material (RPCM) that remains at a consistent 59°F / 15°C, these packs keep you cool and comfortable. It lasts so you can do the same. GlacierPacks hold their cool temperature for up to 2.5 hours in 100°F / 38°C heat and can be fully recharged in just 20 minutes in ice and water. Designed for whatever lies ahead. Some vests feature adjustable straps, others are made with flexible fabric. Whatever your purpose, Glacier Tek Cool Vests are made to fit your needs. Safe for you and the environment. Because they contain no hazardous materials, GlacierPacks are completely safe for the wearer. They’re also biodegradable, so the planet benefits as well. Glacier Tek, a Florida RPCM technology company, focuses on managing body temperature in extreme environments, using high tech garments that help defend the wearer from heat stress. Founded by a Military Veteran, Glacier Tek’s products are 100% made in the USA, using only American raw materials—right down to the thread. Our first product, The Original Cool Vest, was among the earliest completely self-contained body cooling vests available on the market; it is now sold in over a dozen countries under numerous brand names. Glacier Tek manufactures a selection of cooling vests that feature RPCM technology, a thermal energy storage material that is designed to absorb heat generated by the wearer. It maintains a comfortable 59°F / 15°C, even in the most extreme heated environments, and never over-cools. 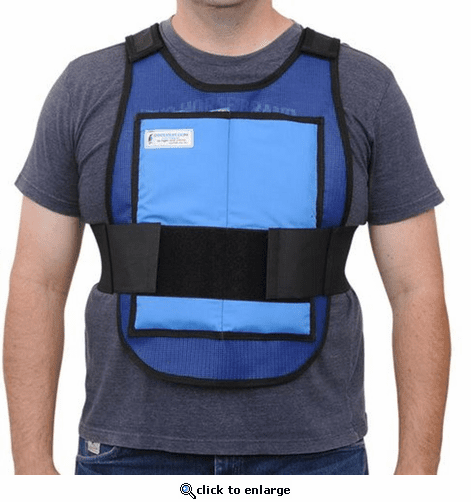 The Glacier Tek Cool Vests come in several practical designs, weigh about 4 pounds and offer better safety and cooling duration than that of evaporative, ice or gel-cooled vests.